I began making photographs of architecture and the urban landscape more than thirty years ago, a vocation inspired by my love for the city where I was born and grew up, Montreal. In the 1950s it was Canada’s largest and one of its oldest cities, and had a built environment of tremendous historic variety and richness. In the mid-1980s when I began to pursue my photographic vocation systematically, I described my motivation (as I have stated elsewhere on this site) as akin to that of the great late 19th – early 20th century photographer of Paris, Eugene Atget, which was, to paraphrase him, to photograph the parts of the city that were old when I was young. And though I was living in Toronto at the time, I returned repeatedly to Montreal to carry out that artistic mission. I have lived in Toronto since 1971 and have turned my camera repeatedly on this city’s streets. It has been a different experience than Montreal. The number of heritage buildings here has always been smaller and they have enjoyed far less protection, so that over the last two decades, a fair number of the buildings I have photographed have literally disappeared, either through mischance or deliberate demolition. In addition, the pace of change in Toronto seems to have accelerated constantly, so that the city I moved to four decades ago barely exists today in many locales. I find myself despairing of the appearance of vast swaths of the city now dominated by nearly identical glass curtain wall condominium towers, hundreds of which have been built in the last two decades. As these buildings have gone up I find myself increasingly drawn to much more modest, century-old commercial structures that still line some of our central city streets. Those three story brick buildings, many of which resemble each other, have warmth and human scale, beautiful masonry, and the character of age. Besides Atget, I have found another kindred spirit in the American realist painter, Edward Hopper. His colour palette, his wonderful depiction and use of light, his architectural renderings, all speak to me. His 1930 painting, Early Sunday Morning, embodies many aesthetic features that I value in my photographs, and its title has been appropriated for this, my latest exhibition. The features of that painting–a frontal view of a row of small tenement buildings with little stores below and apartments above, the raking light of early morning, the colour and texture of the buildings’ brick facing, the implied silence and the hint of the vertical city beyond, are all mirrored in many of my urban photographs, particularly in the photos on display here. Those features are exemplified in the twin images, Queen Street East of Sherbourne, #2 and #3, photographs of buildings that represent to me more than any others the downtown Toronto of years gone by. These buildings’ exteriors have remained almost completely unchanged for decades because of their proximity to a Salvation Army Centre and a mission around the corner and the fact that this was once a very poor section of the city. But gentrification has come to almost all of downtown Toronto and, even if these buildings survive, their appearance is likely to change substantially, as has that of many of the buildings in the surrounding neighbourhood. Many other images in the exhibition are of buildings on Queen Street, most of them from the period of 1880 until the First World War. 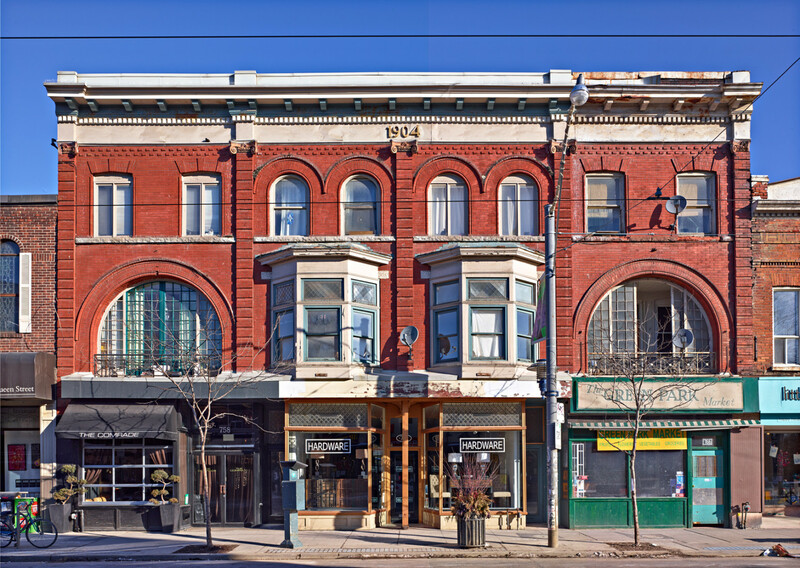 When one considers the changes that have occurred on Yonge Street, King Street, Richmond, Adelaide, Sherbourne, Jarvis, Ossington, even Spadina, and many other downtown streets, it seems to me that we are left only with Queen Street, both East and West, as an important—the most important— heritage street of commercial buildings. This is the one remaining commercial district in which a majority of buildings for large stretches are structures that were built more than a hundred years ago. This is not to say that many of these buildings are necessarily important in themselves but those streetscapes are now all that remain of a previous era. Consequently, I think that much of Queen Street downtown, perhaps from Roncesvalles all the way to DeGrassi, should be given a heritage designation and its appearance protected for decades to come. I believe that the documentary function of photography is its most important artistic strength. We speak of rendering reality with “photographic” precision, and often the finer the rendering in technical terms, the more moving the image. Many artists use the camera and its output today as a tool for creating various forms of art, in the same way they might engage in drawing or painting or printmaking. But photography’s documentary function, when practiced at the highest level, gives us the clearest window on the real world, and nothing is more startling than what one finds in the real world. Photography enables us to see and fix for all time what is before us with greater clarity and more vividness than what we see with our own eyes. I have made images of these various building and streetscapes with the greatest clarity and convincing colour that I could bring to them because this is how they appeared to me at the time I made these photographs. This is how I want people to remember these places. It is very likely that, in time, all that will remain of many of these buildings and streetscapes will be these photographs. I hope these images will in the future recreate for the viewer this distinctive era of the city’s architecture and the pleasure one feels on a street of human scale buildings created with materials and attention to a type of craftsmanship and architectural detail that is no longer possible and mostly not valued. It would be a loss for all the citizens of this city if we cannot preserve at least some of these buildings and streetscapes, as they appear today, as an antidote to the lack of distinctiveness and the functional homogeneity of much of what has been constructed in recent times.